Wolverine State Brewing, 2019 W. Stadium Blvd., is offering a VIP card beginning Monday, May 11, which entitles the bearer to all sorts of swell discounts and privileges throughout ACBW. These include (but are not limited to) 25 cents for your first beer each day, $2 beer specials the rest of the time, and $5 off the May 14 beer and appetizer pairing in the taproom. VIP cards are $18 or $25 with a special commemorative silipint, which you can use in the taproom all week if you want. See more details on Wolverine's website. 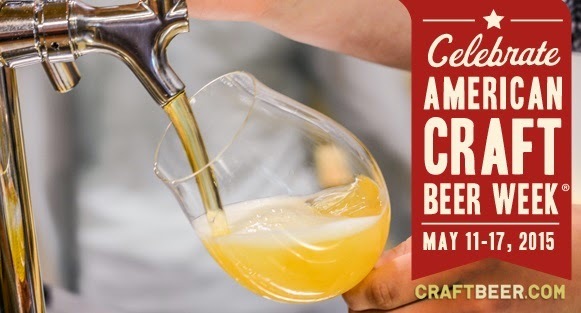 Arbor Brewing Brewpub, 114 E. Washington St., has different discounts and specials each day, including a tour of the brewhouse with head brewer Chris Davies on Saturday, May 16, from 12-2 p.m. RSVP to beth@arborbrewing.com. Go here to see all the other ABC happenings. Arbor Brewing Microbrewery, 720 Norris St., Ypsilanti, is gonna party like it's 1995 in honor not only of ACBW but also of the 20th anniversary of Arbor Brewing's founding. Look for daily Facebook contests, '90s throwback pint prices, specialty brews, and some classics from the kitchen. Follow the brewery on Facebook for updates. And don't forget the first Halcyon Sundaze of the season on Sunday, May 17, from 2-9. I'm working on my setlist as I type this! World of Beer, 1300 S. University Ave., is kicking things off Monday with a 6-9 p.m. tap event featuring Coronado Brewing and Latitude 42 Brewing. On tap look for Coronado's Islander IPA, Orange Avenue Wit, and Sock Knocker Imperial IPA; Latitude 42's Lilikoi Wheat Ale and Party at the Moon Tower IPA; and a collaboration brew between the two: 10 Degrees of Separation English Brown Ale. Use hashtag #wobtrip throughout the week for a chance to win an excursion to three American craft breweries, and watch WOB's Facebook page for more. Each day of the week, HopCat Ann Arbor, 311 Maynard St., is featuring a different brewery on tap. Monday is Dogfish Head (Aprihop, Namaste, Black and Blue, and more), Tuesday is Coronado and Latitude 42, Wednesday is Arbor Brewing, and Thursday is Brooklyn Brewery. Keep an eye on Facebook for specific beer information and tapping times. On Thursday, May 14, from 7-9 p.m., the Beer Grotto, 303 S. Ashley St., is hosting "Hoppy History Night," featuring yours truly talking about and signing copies of Ann Arbor Beer along with featured beers from Arbor, including Buzzsaw IPA, Demetrius Sour Ale, Euchre Pilsner, Phat Abbot Tripel, Strawberry Blond Ale, and a special firkin of Ryeclops Rye IPA. Arbor owners Matt and Rene Greff will also be there to give hugs and high fives.